It's been awhile since I've written a review. That's because I intentionally took on some big books, and this is the first of them that I've finished. It took me nearly 2 months to make my way through this book and I'm still trying to decide if it was worth the effort. In the Introduction of the book, Gaiman says that he wanted it to be "big and odd and meandering." It certainly is that. I did find the premise of the book to be original. When people from all over the world came to American from other countries, they brought their gods with them. Now hundreds and even thousands of years later, these gods are in danger of dying out and being replaced by the newer gods of media, technology, and the like. A battle is brewing. Shadow, recently released from prison, is offered a job by the mysterious Mr Wednesday to be his driver as he amasses the older gods for the coming fight. 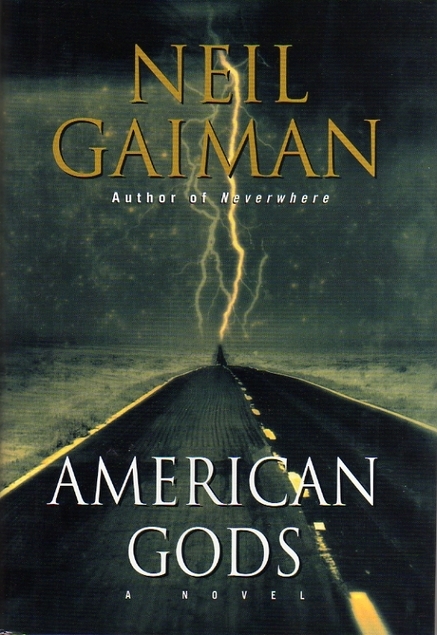 As Shadow and Wednesday make their way through the mid-American landscape, Gaiman introduces a host of characters and places with only a smattering of plot to tie them all together. Here and there he includes more traditional stories and breaks in every now and then with a Coming to America segment that detail how many of the different gods were brought to this country. I found these the most interesting. As much as I liked the premise, I kept waiting for something to happen. When the big climax of the book did happen, ironically it seemed anti-climatic. We went through all those pages for this, I thought? I listened to this book via Audible. It is one of the first books I've listened to that had a full cast recording. I found that really disconcerting at first, not just because it was strange to hear all those different voices, but because the dialogue was so short, the voices seemed contrived. Later though, as I became used to it, I did think the voices helped me keep track of who was whom in the large cast of characters. Overall, an interesting read/listen, but not my favorite.